Need a prescription for a new resume? Formulate a resume for job search success by getting ideas from this sample for a midlevel pharmacy technician. To be a successful candidate for pharmacy jobs, resume expert Kim Isaacs says it helps to have a comprehensive resume. Do you need a prescription for a new resume? 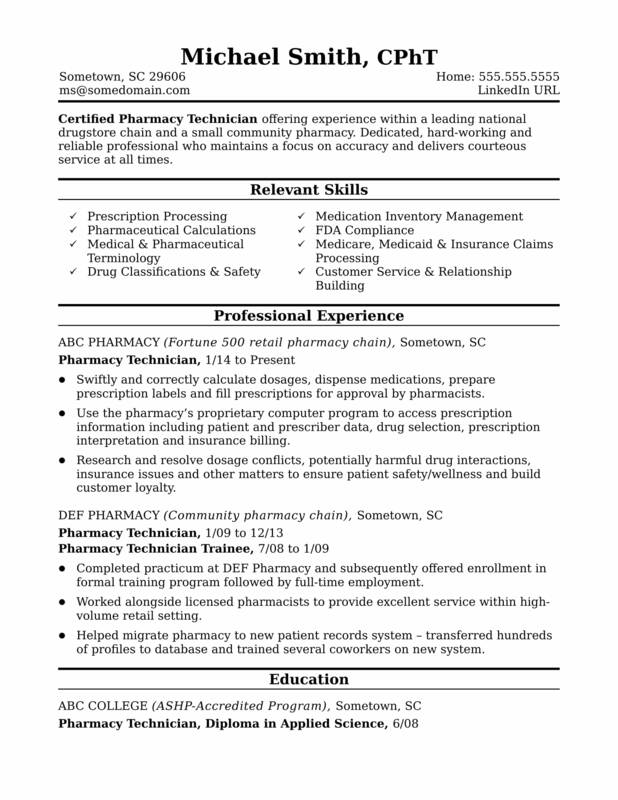 To see how you can formulate a resume that successfully markets your credentials, check out this sample resume for a midlevel pharmacy technician that Isaacs created below. You can also download the pharmacy technician resume template in Word. And if you need more help, let the experts at Monster's Resume Writing Service create a high-impact resume for you that will impress employers. Jobs for pharmacy technicians are projected to grow by 12% (or 47,600 jobs) from 2016 through 2026, which is faster than average, according to the Bureau of Labor Statistics (BLS). You'll find the highest level of employment for this job in the following states: California, Texas, Florida, Illinois, and New York; and in the following metropolitan areas: New York City, Chicago, Los Angeles, Houston, and Dallas. As a pharmacy technician, you can expect to earn a median wage of $31,750 per year, or $15.26 per hour, according to the BLS. Additionally, you can learn about health care careers on Monster. Certified Pharmacy Technician offering more than three years of experience within a leading national drugstore chain and a small community pharmacy. Dedicated, hard-working and reliable professional who maintains a focus on accuracy and delivers courteous service at all times. Use the pharmacy’s proprietary computer program to access prescription information including patient and prescriber data, drug selection, prescription interpretation and insurance billing. Completed practicum at DEF Pharmacy and subsequently offered enrollment in formal training program followed by full-time employment. Worked alongside licensed pharmacists to provide excellent service within high-volume retail setting. Helped migrate pharmacy to new patient records system – transferred hundreds of profiles to database and trained several coworkers on new system. Completed 225 practicum hours at DEF Pharmacy, GHI Pharmacy and JKL Pharmacy.